Mediterranean colours abound along the Kali Mas. This one adorns a godown. The shadows are cast long in the morning. I walk alone along the Mas River, or Kali Mas, that leads from the old town towards the port. To my left are hundreds of godowns – colonial-era warehouses that used to store goods brought in from the far reaches of the Indies. They are all shuttered for the day, possibly for good. The river itself is sluggish and gray, despite its name meaning River of Gold. 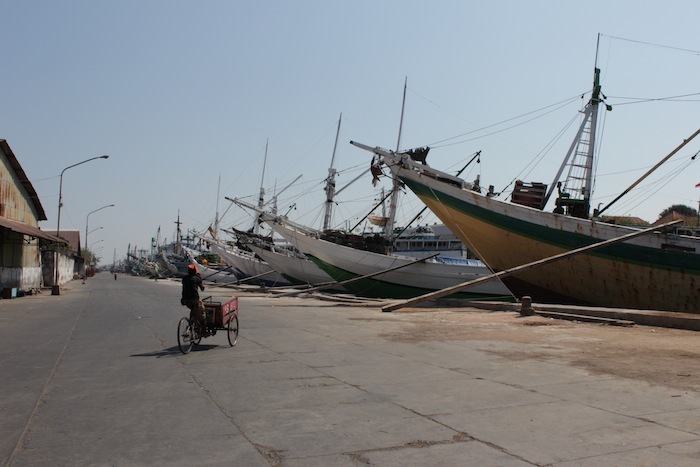 I had intended that morning to walk all the way to the mouth of this river, to catch the fabulous sight of pnisis boats – large wooden schooners – that for centuries have shuttled spices and textiles between here and the island of Madura. Mid-way through my walk, I realised that the distance was simply too far to take in on foot and I turned around to head back where I came from. The very act of turning around afforded me a completely different view of the river and its city. As I approach the old town, the road bends to the left and ahead of me, I can see the river winding to the right, flanked by a dozens of these old godowns with red-tiled roofs and colourful shutters. It is a view reminiscent of Dutch cities like Amsterdam or Leiden, far-flung cities of the colonial regime ruling these parts from the 17th to the 20th centuries. So this is what it looked like then, I thought, Oud Soerabaja, second only to Batavia in wealth and fame. 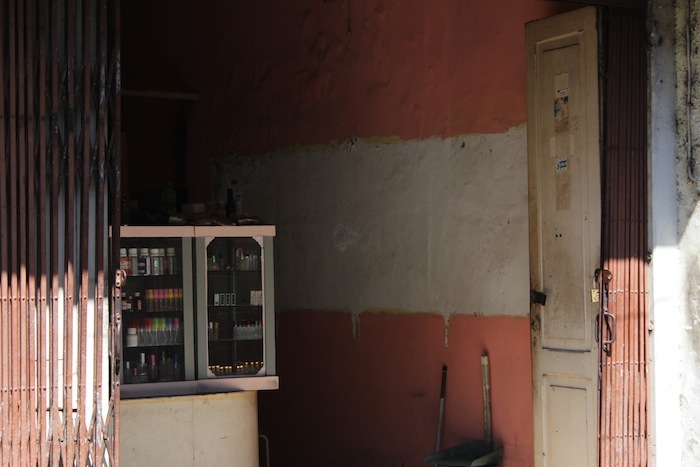 Glimpse into a perfumery in the Arab Quarter of Ampel. The city was refreshingly quiet that weekend, due to the Festival of Eid – or Idul-fitri in local parlance – which marks the end of the Muslim fasting month of Ramadan. The streets bore witness to a much reduced flow of cars and motorcycles – a far cry from the traffic gridlock that would normally plague these same thoroughfares any other day. Everywhere, doors were shut; everywhere, that is, except for the Arab Quarter of Ampel, in the Old Town. There, the streets were thronged with cars and becaks (cyclos) bearing families, dressed in brightly-coloured festive baju (clothes), out visiting. The stores in Ampel were all open for business. Run by the descendants of Yemeni Arabs that emigrated here in the 19th century, these stores sell much the same goods and products they have done in the past two centuries: textiles, dates and those wondrously fragrant Arab perfumes and scents. Down by the fish market – Pasar Pabean – local ladies haggled over the remains of that morning’s catch, hoping to purchase the biggest and the freshest in preparation for the family feast that would inevitably take place that evening. A Chinese ash house – where one worships the dead. Slipping into Chinatown, just south of Ampel, I encounter a completely different scene altogether: one of dereliction and neglect. Many of the city’s Chinese had moved out of the old Chinese quarters decades ago when the centre of economic activity shifted further south of the city. 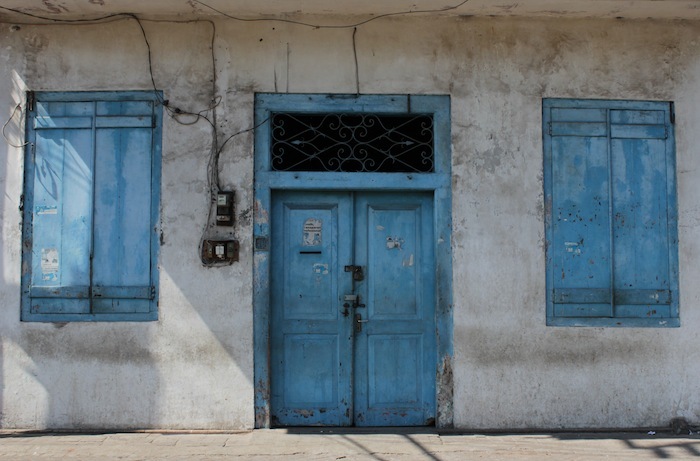 What remained was a ghostly landscape of two-storey shophouse buildings – the kind found all over port cities in the Malay Archipelago where there were sizeable Chinese communities – interspersed with an older vernacular influenced by the courtyard houses of southern China. Two stunning specimens of this style of architecture sat along Jln Kembang Jepun (a reference to the days when the Japanese plied these streets), just past the gates of Chinatown. These were ash houses, or houses dedicated to the worship of ancestral spirits. One of these was the preserve of the Han clan, the other the The clan. Most of the Chinese, having converted to Christianity along with their move south, had abandoned the traditional practice of ancestor worship, and so it was somewhat of a miracle that these two houses remained in a good state of preservation. As I peered through the ornate gates surrounding them, I wondered if they were still inhabited by spirits, or if these same spirits, having lost their worshippers, had long since vanished into the ether. The Old Town is split into the European and Asian (Chinese and Arab) quarters by the Mas River, over which extends the Jembatan Merah, or Red Bridge. The Bridge is significant in the history of modern Indonesia. It was here that the Battle of Surabaya – the most important pro-independence struggle against Dutch and British re-occupying troops – was initiated in 1945, just weeks after Sukarno’s declaration of Indonesian Independence in the aftermath of the Second World War, and the Dutch colonial regime’s repudiation of this declaration. On 26th October, as a British Brigade Commander’s vehicle passed through the Jembatan Merah area, the vehicle was surrounded by Indonesian militia and in the ensuing skirmish, the Brigadier was hit and killed by a stray bullet. All out war ensued, with more than 6000 Indonesian resistance fighters losing their lives. They are commemorated by a Heroes Monument in the city and by a public holiday – Heroes Day – on 10th November, the day the war ended. 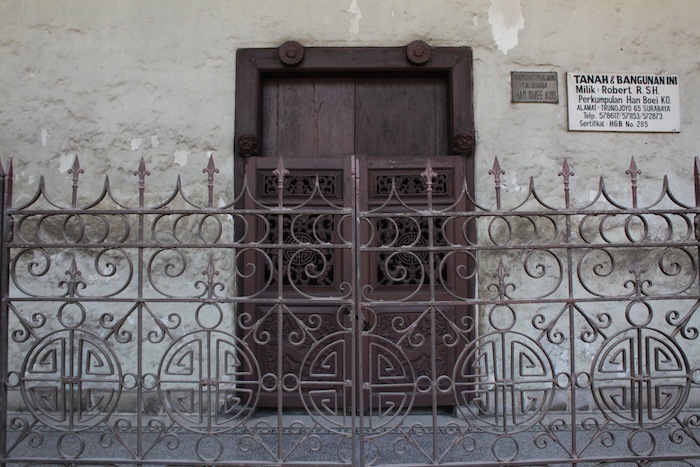 The facade of an old colonial trading house, by the Mas River. Across the Red Bridge, the European Quarter begins in earnest, and stretches for a good eight kilometers to the suburb of Wonokromo, making Surabaya the city with one of the most extensive tracts of extant colonial architecture in Southeast Asia. It wasn’t that the locals loved their old colonial masters: the Dutch were universally loathed for having treated the Javanese as nothing more than slaves, subjecting them to centuries of cash-cropping that kept them impoverished and dependent. The fact was that with independence having brought no reprieve to poverty and to the entrenched class system in Javanese culture, there simply was no resources nor the will to demolish these buildings, and so they remained, re-occupied by banks, government institutions, and wealthy Javanese families – the inheritors of the Dutch colonial land-owning class. The most impressive instances of colonial architecture occur along Jalan Rajawwali, by the banks of the Mas River. Here sit the headquarters of old trading and merchant houses – the Dutch were after all, a nation of merchants, and there is a cleanness and no-nonsense functionality to the architecture here that distinguishes it from the more ornate English, Spanish or French colonial tradition elsewhere in Southeast Asia. Many of the buildings here, however, have not aged well and are in dire need of restoration. A large expanse of colonial-era villas had also been cleared very recently to make way for a spanking new mall – the Jembatan Merah Plaza. The facade of the House of Sampoerna, with the Chinese character for “King” atop its roof. Nonetheless, one significant villa in the vicinity still stands and has been restored to its former glory. 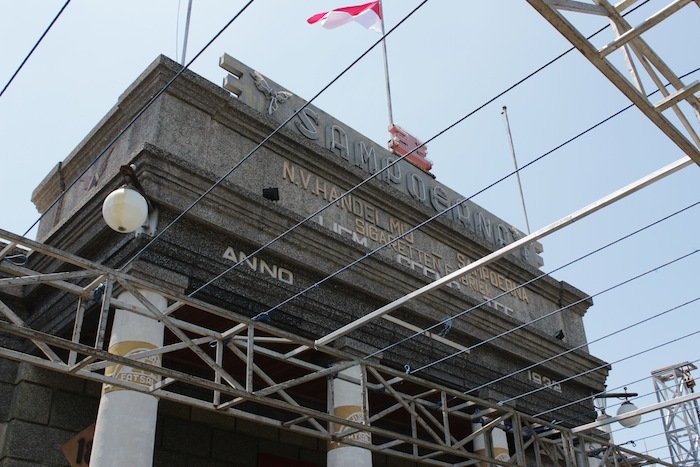 This is the House of Sampoerna, named after Indonesia’s biggest cigarette brand, and once a factory and private domicile of the Chinese magnate that founded the company. 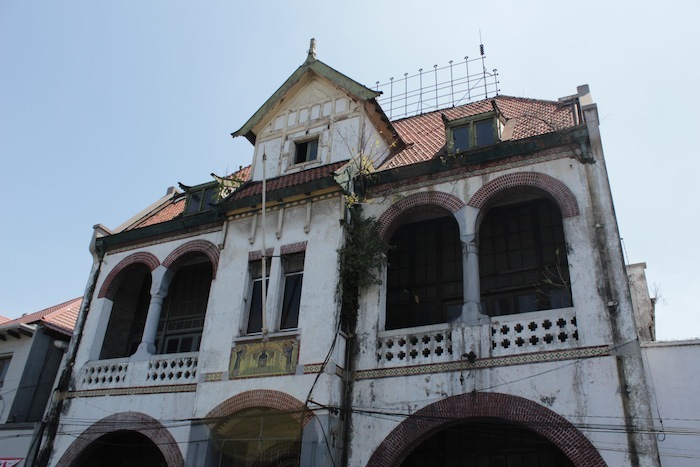 Chinese-Indonesian Liem Seeng Tee, whose family name would be Indo-ised to Sampoerna in the ‘60s, bought and restored this Dutch colonial mansion in the early 20th century, embellishing it with stained glass windows that brandish the Chinese character for his family name – 林 – alongside the Chinese character for “King” – 王 – demonstrating an unabashed self-consciousness of his own wealth, power and influence. The house is a free museum today, accompanied by a delightful restaurant, and offering free bus tours of the City. I opted, however, to take a long, leisurely walk down the broad, tree-lined motorways, south of the Red Bridge towards the downtown core of Tunjungan. Dutch colonial-style bungalow in the Tunjungan area. Along the way stood magnificent pieces of commercial colonial architecture, many of which were built in the 20s and 30s in an exuberant Art Deco style. Secreted amongst these buildings, and the increasingly frequent modern high-rise malls and apartments, were the occasional colonial-era bungalow: squat and compact, single-storeyed red-tile-roofed affairs that often stood mutely behind shut gates. 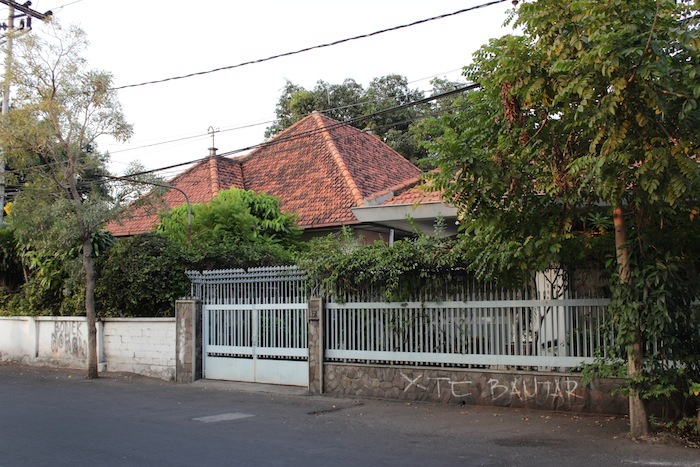 When I first arrived in Surabaya, my taxi had taken me past a major street (Jalan Raya Darmo) flanked on both sides by row after row of these bungalows; and I had marvelled at how so many of these relics from the not-so-distant past had been retained with little of the rancor and anxiety that characterised other post-colonial cities’ treatment of their built colonial heritage. The walk that morning from north of the Red Bridge back to my hotel – the legendary Hotel Majapahit on Jalan Tunjungan – took me almost three hours to complete: testament to the size of the colonial core of the city. I wasn’t satisfied, however, with all that I had seen and photographed, having not been able to reach the ancient port of Kali Mas on foot, as I had thought I’d be able to. The next morning, I would take a taxi to the port, almost missing it due to my driver’s inability to speak English and a marked anxiety and carelessness in his driving as a result. Along the banks of the Mas River were docked more than twenty splendid ships painted an array of bright colours, sitting idle over the Eid weekend, after which they would once more, make the weekly journey to Madura island and further out to Ambon in the Moluccas. Dozens of pnisis slumbering along the old Kalimas port. Strolling along these fabled schooners, I felt rush over me that elusive sense of tempo dulu – an Indonesian term that captures a sense of melancholic nostalgia for a time long past; a nostalgia characterising many Dutch repatriates’ reminiscences and written accounts of their time in the Dutch East Indies. While I could under no circumstances ever comprehend what the Dutch and the Indonesians experienced during three centuries of uneasy co-existence, here at least, I thought was proof of a majestic past that transcends these differences, and was still, very much palpably alive today. NEXT POST: Hotel Majapahit, Surabaya – an account of my stay at this magnificent sister hotel of the Raffles in Singapore. Gallery | This entry was posted in Art & Architecture, Cities & Regions, Culture & Lifestyle, Landmarks & History, Photography, Travel & Mobility and tagged Colonial Heritage, Indonesia, Kalimas, Old Town, Pnisis, Surabaya, Tempo Dulu, The Grand Tour, The Grand Tour of Southeast Asia, Tim Hannigan. Bookmark the permalink.